Status in Hawai’i: Alien. High pest factor. Where it grows in Hawai’i: Dry sunny areas. When driving by an abandoned cow pasture in a dry area one may come across a field of brilliant yellow flowers. 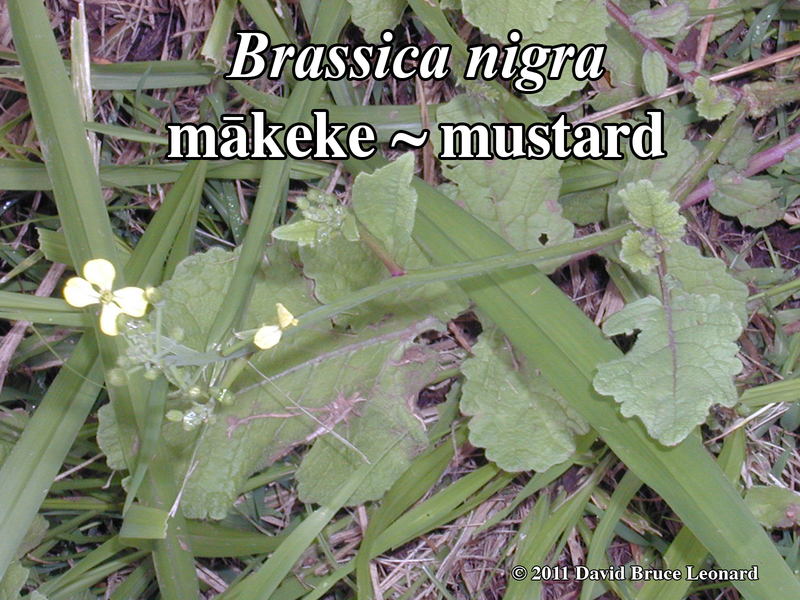 Chances are this is a field of mäkeke (black mustard), a common roadside weed in disturbed and dry areas. Mäkeke leaves are very warm and stimulating. A digestive stimulant and expectorant, the young greens can be used as a pot herb. Used by the Chinese and Native American tribes for asthma, poor digestion, and toothaches. The ground seeds can be infused for bronchial infections, colds and flus and rheumatism. Use one cup boiling water over 1 teaspoon of seeds. When the seeds are made into a plaster, it can be used topically for pneumonia, neuralgia, gout, fever and chills, and tendonitis. SEE CAUTION. Research on mäkeke indicates that chemicals in mustard family vegetables can increase metabolic rate and may reduce the incidence of estrogen sensitive cancers. Mäkeke is a symbol of fertility in India. In Denmark it is used to keep away evil spirits; and when mixed with ginger and peppermint, is said to increase libido in women. First brought to England by the Romans as a condiment for meat, mustard is rich in beta carotene and vitamin C. It is second only to pepper on the world spice market. A plaster made from the seeds can BURN THE SKIN. Do not fall asleep with it on, nor leave it on too long. By the way, BE CAREFUL… Mustard oil in the eye is an experience you will remember for a long time.